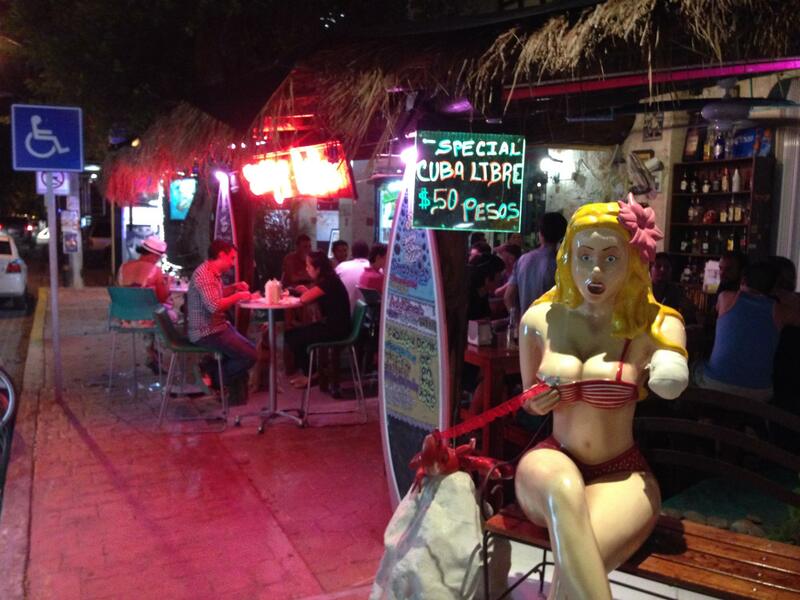 One of my favorite places to eat in Playa del Carmen is at Skinny Bikini Potatoes.!!! They have the best stuffed potatoes including ones topped with vegetables or chicken breasts or steak and even lobster.! They are delicious and economical.! 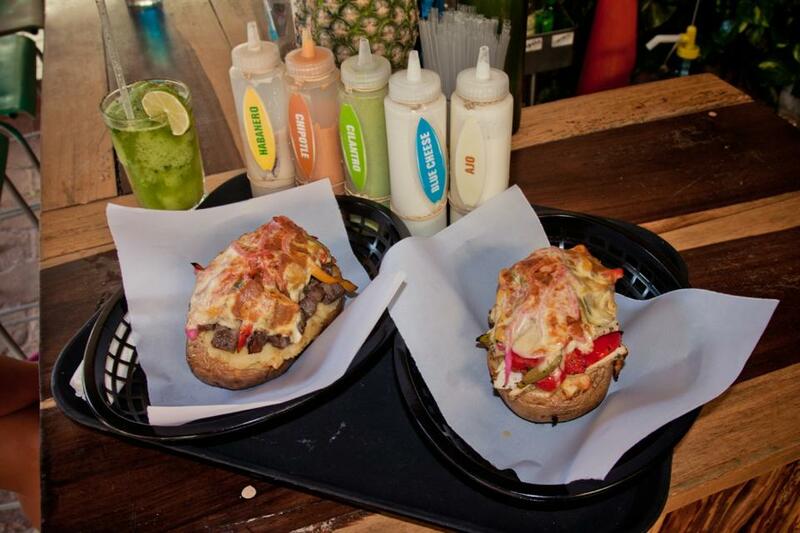 Plus they have some of the best sauces to top off your stuffed potatoes – chipotle, cilantro, garlic, blue cheese, and habanero.!! And you guys know how I feel about sauces.!! Yummy.!!! But the restaurant’s claim to fame is their almost 8 foot tall skinny bikini girl named Ethel.! Ethel sits outside the restaurant mostly enjoying the sun and trying to keep Lester the lobster from pulling down her bikini top.! jajaja… However, Ethel also sometimes decides to go hang out with the locals and tourists and disappears for days at a time. One time, she disappeared for 2 months.!! Only in playa.!! Last night some one stole or borrowed the skinny girl for “A NIGHT ON THE TOWN” if any one has seen her at the beach or around playa del Carman please bring her back or call us. Reward offered. YES WAY! Its the third time. first time the cleaning girl found her in a room she was in someones room at the Reina Roja hotel. second time she was having a drink at the outside bar with Mr Senor Frog himself..
whoever took Ethel please can you return her tonight!! No Ethel tomorrow we are replacing her with a live real mermaid.. You have been warned thief! We still can’t find our Skinny Girl. She went on a date and never came back! Ethel finally came home battered and beaten up perfect gift for Halloween.